My research adopts a strong interdisciplinary approach to synthesize general circulation climate models, phylogenetics, species distribution modeling, statistical and mathematical models, morphology, and ecometrics to understand how species respond to their changing environments. In addition, I am interested in developing new methods for modeling the evolution of multivariate systems (e.g., multidimensional climatic niches, genetic covariance matrices, and morphological shapes) and to reconstruct their phylogenetic changes. The paucity of methods to simultaneously deal with covariance and the non-independence of species and traits hampers ecological and evolutionary analysis. Multivariate systems with high dimensionality and complex correlation structures are a fundamental component of phylogenetics, quantitative genetics, climate change biology, ecology, and paleontology. How do species respond to climate change? How species respond to climate change is a matter of intense debate in modern biology. In a recently published study on the effects of climate change on rattlesnake geographic distributions, I found that rattlesnakes do not adapt as fast as the climate has changed, and the changing climate, as opposed to evolutionary change, was the driving force behind shifts in distributions of rattlesnakes in the past 320,000 yrs (Lawing and Polly 2011). 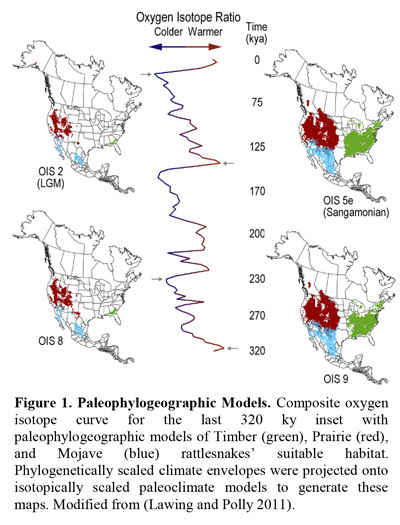 I integrated lines of evidence from the geological record (stable oxygen isotopes), the fossil record, global circulation models, climate envelope models, and phylogenetic comparative methods to develop a paleophylogeography model of eleven rattlesnake species (three are shown in Figure 1). The novelty of this work stems from the integration of methods used across several disciplines and from the interpolation technique I used to produce paleoclimate maps at 4,000 yrs intervals for the past 320,000 yrs. I used a combination of Mathematica, ArcGIS, and MySQL to implement the models. I projected models of suitable habitat onto future climate maps representing a 1.1ºC and 6.4ºC increase and found the annual rate of displacement over the next century will likely be two to three orders of magnitude greater (430-2,420 m/yr) than it has been on average for the past 320,000 yrs (2.3 m/yr). In general, many species will have to move farther and faster than they have in the past to escape extinction. My next step is to expand the application of these methods beyond rattlesnakes to vertebrates in North America (reptiles and mammals). Occurrences and distributions for many animals are now available from the Global Biodiversity Information Facility (gbif.org) and the International Union for Conservation of Nature and Natural Resources (iucnredlist.org) and some of their paleodistributions are available from the Paleontology Database (paleodb.org). Patterns of species’ occurrences compared with their available, suitable habitat reflect the limiting factors on their distributions and these patterns are a good indicator of the importance of biotic effects on a species’ distribution (Lawing et al. 2012a). I will tease apart the influences of climate change and phylogeny on species’ distribution models of the North American vertebrate biota. My aim is to predict the features of animals that are more sensitive and more robust to climate fluctuations, biotic interactions, and adaptation. I will calculate the rates of change in geographic distributions expected over the next century and compare them with historical rates of change. In addition, I will develop user-friendly software to implement this method and make it freely available. Software will include visualizations of a species’ response to glacial-interglacial cycles (e.g., Video S1). How do biotic systems interact with the changing environment? Species interact with their environment through their traits at all temporal and spatial scales. Any ecomorphological trait that can be measured across a set of species in a community can be developed into an ecometric. Ecometrics is the geographic study of community trait distributions. The study of ecometrics aims to depict traits that are closely tied to their function and are easily measurable. Because snakes are speciose and utilize a wide range of environmental substrates through morphological specializations, they are particularly good candidates to develop ecometric indexes. 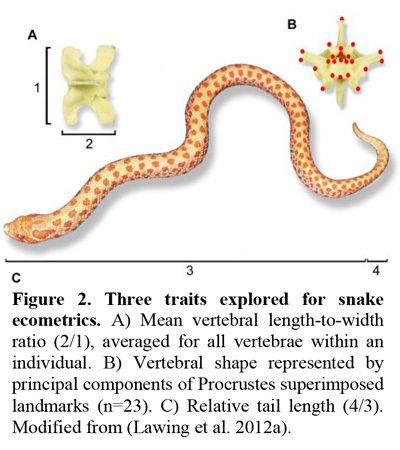 In a recent study, I explored three ecomorphological trait in North American snakes (Figure 2) and developed the trait that was best explained by substrate use, relative tail length (R2 = 0.71), into an ecometric (Lawing et al. 2012a). I developed the ecometric, relative tail length, by calculating community averages for all snakes that occur within the same 50 km2 region for the continent of North America, implemented in a combination of ArcGIS, Mathematica and MySQL. Mean relative tail length is highly associated with Bailey’s ecoregion provinces and vegetation cover (R2 = 0.65 and 0.47, respectively) (Figure 3). This strong association suggests that snake community morphology can be used as an ecometric indicator of the environment and serve as a proxy for paleoenvironmental interpretation. How do multivariate systems evolve? Phylogenetic comparative methods have been developed to deal with the non-independence of species, but often the non-independence of traits is either ignored or the covariances between the traits are treated as static, despite the fact that the covariance structure has been demonstrated to evolve even over relatively short timescales. A better model of multivariate evolution is needed to approach biological reality. My research aims to elaborate a new framework, the Dynamic Rotation Method (DRM), for modeling the evolution of multivariate systems and to reconstruct phylogenetic changes, including ancestral states. This method explicitly deals with the non-independence of traits and variant covariance structures by treating the covarying traits as a mathematical system that rotates, translates and scales through trait space (see YouTube Video for a two trait, two species animation that I generated). The application of the DRM to multivariate systems will provide a synthetic interdisciplinary framework for the integration and comparison of the study of phenotypic evolution, modularity and integration, geometric morphometrics, niche modeling, and habitat modeling in a phylogenetic context. I have a particularly interdisciplinary perspective that can facilitate synthesis across disciplines because of familiarity with multivariate systems in studies of evolutionary morphology (Meik et al. 2010), geometric morphometrics (Lawing and Polly 2010), and ecological niche modeling (Lawing and Polly 2011, Lawing et al. 2012b) and from my experience with evolutionary simulations (Lawing et al. 2008). Lawing, A. M., J. J. Head, and P. D. Polly. 2012a. The ecology of morphology: the ecometrics of locomotion and macroenvironment in North American snakes. Pages 117-146 in J. Louys, editor. Palaeontology in Ecology and Conservation. Springer-Verlag, Berlin and Heidelberg. Lawing, A. M., J. M. Meik, and P. D. Polly. 2012b. Climate and Competition Shape Species Borders: A Study of Panamint (Crotalus stephensi) and Speckled (Crotalus mitchellii) Rattlesnakes. ISRN Zoology 2012:1-6. Lawing, A. M., J. M. Meik, and W. Schargel. 2008. Coding meristic characters for phylogenetic analysis: a comparison of step-matrix gap-weighting and generalized frequency coding. Systematic Biology 57:167-173. Lawing, A. M. and P. D. Polly. 2010. Geometric morphometrics: recent applications to the study of evolution and development. Journal of Zoology 280:1-7. Lawing, A. M. and P. D. Polly. 2011. Pleistocene Climate, Phylogeny, and Climate Envelope Models: An Integrative Approach to Better Understand Species' Response to Climate Change. PLoS One 6:e28554. Meik, J. M., A. M. Lawing, and A. Pires-daSilva. 2010. Body Size Evolution in Insular Speckled Rattlesnakes (Viperidae: Crotalus mitchellii). PLoS One 5:e9524.